The company were presented the award in front of a packed audience of industry professionals at a gala dinner at the London Hilton on Friday 28 September. It is the second time the Yorkshire-based Toolmaker has won the coveted award. In 2016, Faulkner Moulds won for what the judges called, “an exemplary example” of a toolmaker taking ownership of a project and successfully working in partnership with their customer. This year, the company has been shortlisted for successfully delivering a major project for BCA Group, in the leisure and automotive industry – 4 tools, weighing 4 tonnes, in just 5 months! With extremely challenging delivery timescales, BCA would have lost significant business if the tooling was late. Specialising in complex tooling solutions, and product and tooling development and design, the company uses Design for Manufacture principles to optimise manufacturing quality and cost-efficiency for their customers. 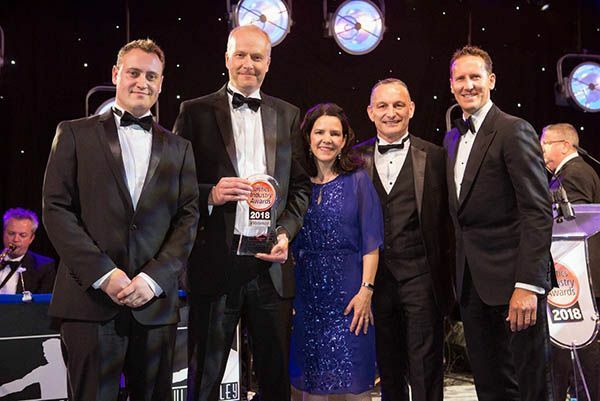 Managing Director, Duncan Faulkner said, “It is phenomenal to win this award again and is all thanks to our fantastic team, who work to the highest standards in all they do”. Described by BCA Group as, “Honest, reliable and transparent”, Faulkner Moulds pulled out all the stops and delivered every one of the tools early, putting their customer in a comfortable, advantageous position. The toolmaker solved several problems, incorporating innovative tooling solutions, without compromising their customer’s delivery date, quality requirements or budget. Furthermore, all four tools moulded right first time, on size, with no flash or other issues. They continue to run efficiently, supported by Faulkner Moulds’ post-delivery guarantee. The products are 100% made and sold in the UK, and now exported to Europe. As Wayne Boyd, Sales and Marketing Director of BCA Group commented, “Faulkner Moulds are a rare breed in this field. Excellent quality, on time, every time, no exceptions. I have nothing but praise for this professional toolmaker”.